October is breast cancer awareness month. October 2nd is also the day my Mom passed away from cancer 12 years go. As I write this I'm thinking about her, my grandmother who fought breast cancer and all the people who have been and are affected by cancer in some way. I write a lot about optimism and positivity and over the years I've learned it's easy to write about it. It's much harder to live it. Breast cancer survivors and people who are fighting cancer teach me what real optimism, faith and courage are all about. They demonstrate that we are positive, not because life is easy, but because it can be hard. They show me they are the ultimate Positive Warriors who take on the battle and fight for tomorrow. 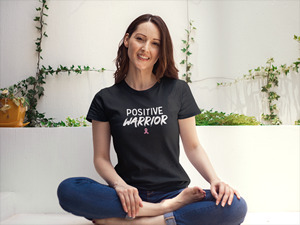 When I got involved in Positive Brands and created Positive Warrior shirts I did so to encourage others, to remind people of the positivity and power they possess and to help them share their positivity with others. 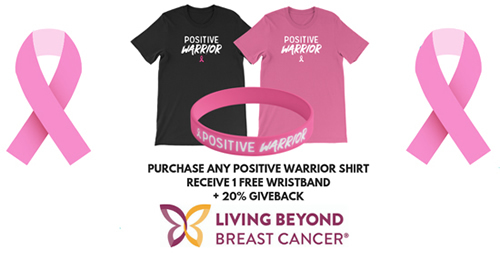 Since October is breast cancer awareness month I hope you will join me in encouraging and supporting these Positive Warriors by wearing one of our special shirts and/or a pink Positive Warrior wristband. 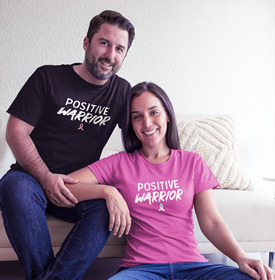 Get one to encourage someone who is struggling or wear one to show your support and help us raise money for Living Beyond Breast Cancer. Let's make a positive difference together!